At a time when everything in the High Street seems to be closing and all seems a little bleak, there is a glimmer of hope glinting in the rare rays of sun over at Wotton Under Edge. At a smallholding just outside Wotton, little seedlings are gingerly poking their heads into a brave new world where community and social enterprise combine to bring local people fantastic vegetables, grown to organic principles with virtually no food miles. EdgeVeg is a new venture, run by Lara Madge. Based on the model of Community Supported Agriculture, members of EdgeVeg have the benefit of a delicious box of vegetables every week delivered to their door. 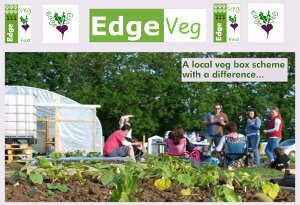 Unlike other veg box schemes, EdgeVeg has the benefit of being truly local and interactive. Members can come and visit the plot, dig and sow, if they so wish, or just attend the many social events centered around the plot during the year. Kids are actively encouraged to get their hands dirty and learn more about the vegetables that end up on their plate thereby encouraging them to eat the greens that they so often resist. EdgeVeg started last year with a bare patch of earth and ten families eager to get involved. With the help of everyone working together, a polytunnel was erected and raised beds built. In its second year, there is a lot less infrastructure to put in place so more emphasis can be placed on the vegetables themselves and sowing has already begun. The scheme has opened up to more families and many events are planned for 2013, including Volunteer Days, Barbeques, and Open Days. Emphasis is also being placed on beauty as well as practical elements with flowers being grown so hand tied bouquets become part of the vegetable box.